These wooden dolls were for sale at the Japanese Market - I mean who could resist? In my last blog talked about my collections and how they influence my designs. I was recently lucky enough to travel to Japan with Stitchtopia on a textile holiday – a whole new excuse to start more collections and memories. It was quite an incredible holiday, Japan is a country of exotic wonder so refreshingly unlike anything we have come to know and love in Europe it has something to surprise around every corner. One of our trips on the holiday was to a traditional Japanese market where i saw these stunning little wooden Japanese Dolls. 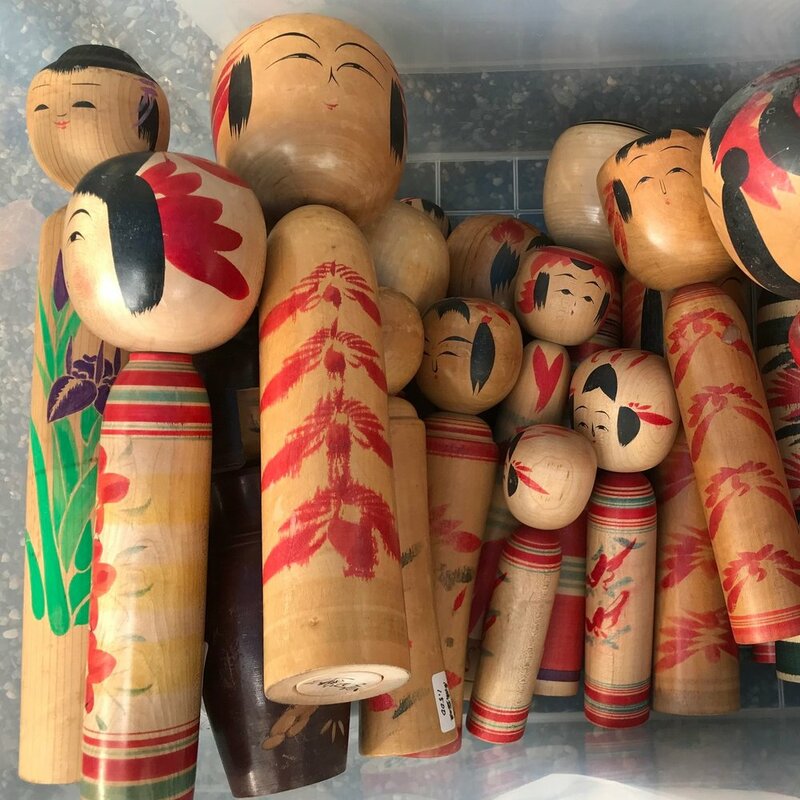 I had seen similar ones the previous year and bought one as I have a lovely collection of wooden dolls at home and these old children’s dolls would fit in perfectly to that collection. This stunning quilt shows the traditional Kokeshi Dolls that are so typical in Japan. See more pictures of this amazing quilt below. So, this year I had decided if I saw some I would definitely buy another but when I saw these I ended up buying three as they were so cheap! I will give one to my granddaughter, the one I chose for her one has a-wobbly head. Very excited with my market finds, I pack the dolls away in a suitcase and forgot about them. There is so much to see and do in Japan that it is all too easy to move onto the next exciting thing. My Japanese Doll collection, back safe at home in Hailsham! 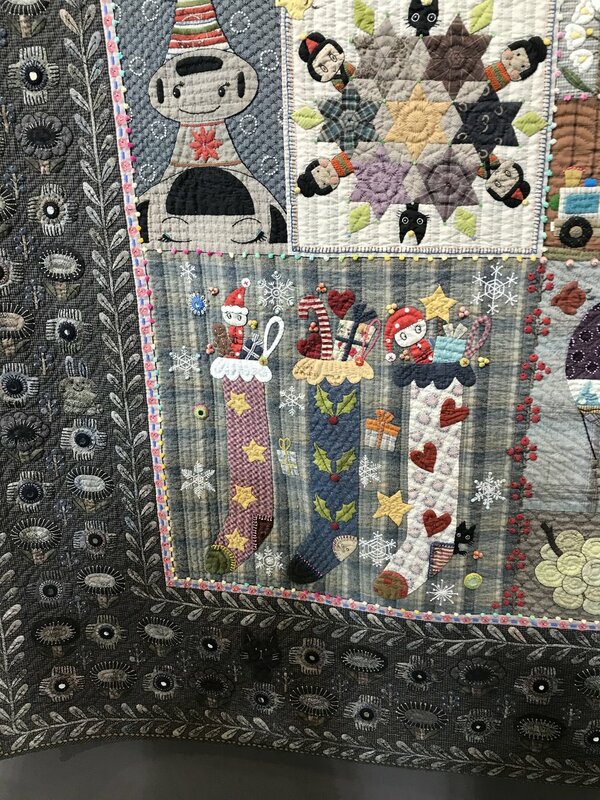 Ten days later we are at the Tokyo International Quilt Festival and just look what jumped out at me from all the amazing quilts there. 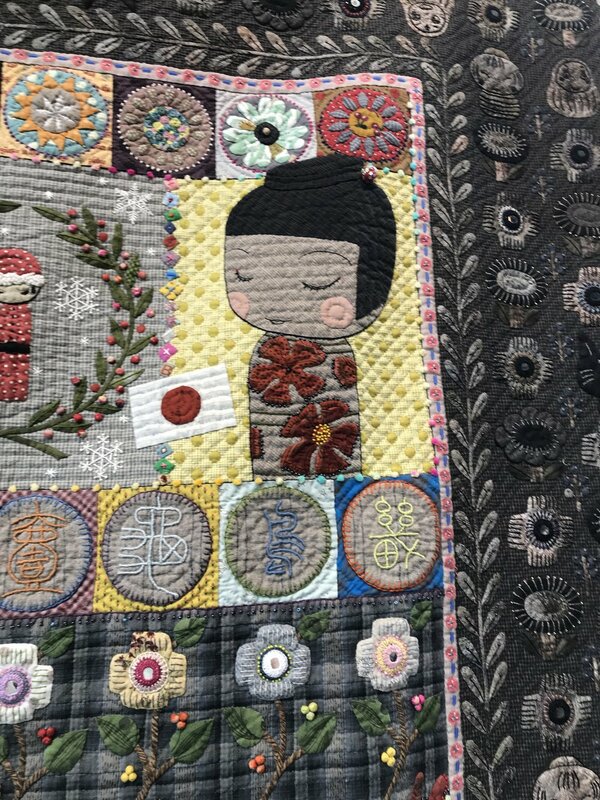 The wooden dolls depicted in this quilt are called Kokeshi. As well as the stunning subject matter the design and quilting is breath taking, definitely one of my favourite quilts of the show. Our wonderful tour guide, Yuka, was so taken by my love for the wooden dolls and this quilt she gifted me her dolls as she thought I would look after and love them more than her! I certainly will look after them and I have a bigger collection and more treasured memories. What a wonderful outcome!